The Lev (or “leva” in plural) is the currency of Bulgaria. It is divided into 100 stotinki (nicknamed “stinkies”). 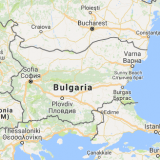 wikipedia – Bulgarian_lev Although Bulgaria joined the EU in approximately 2007, luckily they decided not to change their currency to the euro. I say “luckily” as I think prices seem to go up when countries use the euro. 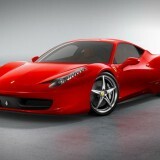 As with all currencies, the exchange rate goes up and down. 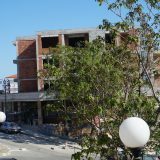 Whenever we go to our apartment in St Vlas we usually change our money in the Co-operative Bank in the square. We’ve normally found that to be the best rate and it’s easy enough to do – go to one of the desks and tell them how much you want to exchange. 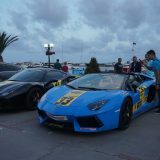 Recently you have had to provide some ID – driving licence, passport etc. to the person at the desk (it used to be enough to tell them your name but that’s not the case anymore). They print off 2 forms, you sign both and then take them to the cashier with your cash/travellers cheques etc. and she (it’s always been a ‘she’ so far) hands you your leva. When we went over in March this year (2015) the exchange rate at the bank was 2.69 leva/£ which was definitely better than when we holidayed in September last year. As with anywhere you go, another way to get your cash is to use one of the ATM machines scattered around the village. 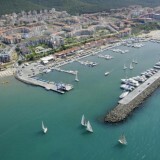 In St Vlas, there’s one outside the Co-Op Bank in the village square, one outside the Laguna Hotel, one outside the supermarket opposite the Sky Hotel and one at the Palace Hotel on the marina, to name but a few. There are loads of these everywhere but be careful. 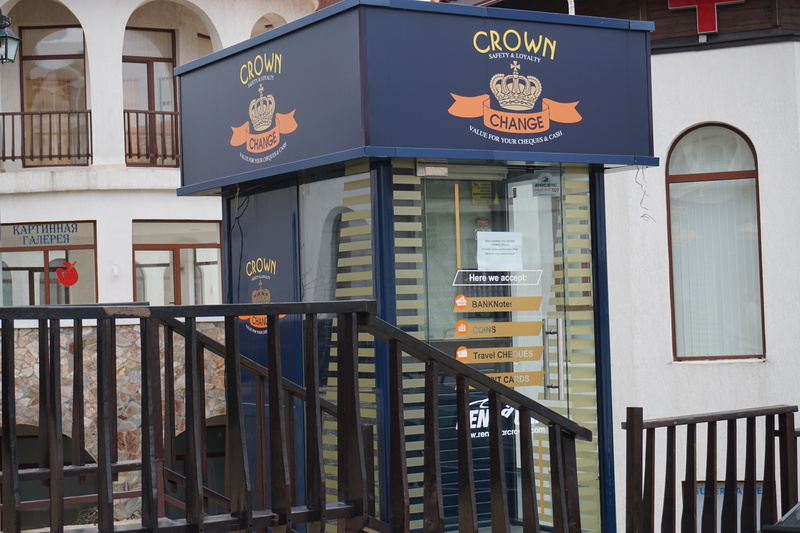 We’ve always been advised to only use the “Crown” kiosks as they are trusted. If you use one of the others don’t be fooled into thinking you’re getting a better rate. It may look as though you’re getting more for your money when you read the board outside but when you come to actually exchange your currency, you may not get as much as you expect! 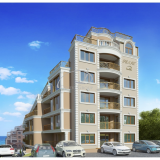 Very often there’s a statement at the bottom of the board saying (in Bulgarian, of course) that the rate being published is only available if you change a certain amount of money – which is usually a very large amount. We’ve occasionally seen people arguing with the cashier, telling them they’ve not given them enough back, only to be told that the rate doesn’t apply to the amount they’ve tried to change. So beware, I would only use the Crown kiosks if I was you. You can also go into one of the many hotels to change your money. We’ve usually found that they don’t give quite as good a rate as at the banks though. 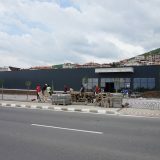 Many of the supermarkets also offer change facilities – the Gloria Mar supermarket on the main road opposite Vlas Casino for instance. We’ve never changed our money there. 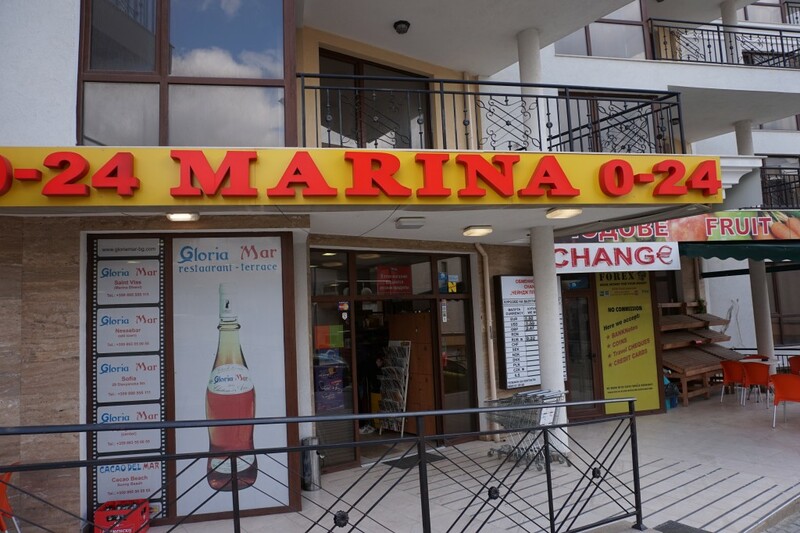 Gloria Mar Supermarket in Vlas is open 24 hours and has a lovely selection of cakes! We have sometimes been approached by people in the street, offering to change our money. We would never, ever consider trusting them. For a start, how do you know it’s not fake? !